The 'Little Mermaid' in the world of swimming has done it again! The only Indian and youngest in the competition, 11-year-old Swapnali Yadav, won the 10-mile course for female youth (under-18) at the prestigious Kingdom Aquafest that was held on the shores of Lake Memphremagog, in the heart of Northeast Kingdom, Newport, Vermont, USA on Saturday, July 24. Taking to the waters in near-perfect conditions at Prouty Beach, Swapnali completed the swim in an impressive time of 6 hours, 23 minutes, 13 seconds at the same point. 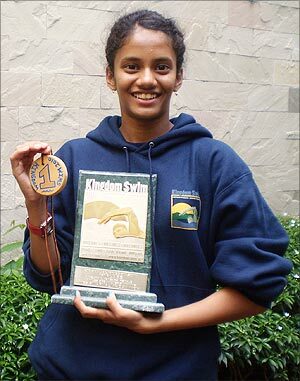 Swapnali, of Bombay Cambridge High School, Amboli, Andheri (West), was invited by the United States Master Swimmers (USMS). The swim was approved by USA Swimming and world ruling body FINA. She added the Kingdom Aquafest effort to the outstanding performances as the youngest-ever in the world in the 2007 Open World Swimming Marathon and the 30km Messinikos Gulf Swim in 2008-09, both in Greece, and the 2009 Bermuda Round the Sound Open Swimathon, to announce her arrival in international swimming. "The weather was good and I was in the right frame of mind. I had no problems with a good support staff alongside that included my father Gopal and mother Sailee. I felt confident at the start and was truly delighted at finishing first," said Swapnali. "Once again, it was a rich experience. Most of the swimmers were top class. Some were Channel swimmers and former Olympians," Swapnali revealed. Swapnali featured in a competition with an age spread of seven to 68 years. Her support staff followed her in a kayak and provided nutrition, water and direction during the swim. The Kingdom Aquafest was blessed with greatness, with a world class challenge to many that included [English] Channel and double Channel crossers, former US Olympic team members and speedsters of all stripes. "Swapnali led an astonishing group of youngsters taking on the full gamut of distances this year," said Phil White, meet director and Chairman of the Board of Indoor Recreation of Orleans County (IROC). "In establishing our rules for the Kingdom Aquafest we have tried to be fair to all and maintain consistency with several of our primary goals. This event provided a world class challenge to many upper level and competitive marathon open water swimmers. This event was a fun and well-supported experience for the participants and an inspiration for many to push themselves just a little bit farther with their training and conditioning," White added.